Wine cellar furniture Classic Champagne Version with Esigo 2 Classic solid oak wall-mounted wine racks, Esigo 3 Classic solid oak wine racks and the pupitre Esigo 3 Classic Champagne. This wine cellar has been furnished with Esigo 2 Classic solid oak wall-mounted wine racks, fitted with the patented system that holds the bottles at just the right angle. A perfect combination of beauty and techniques. 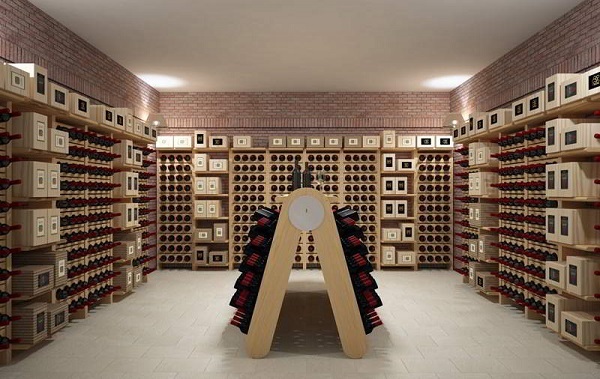 The Esigo 3 wooden wine racks have been placed in the centre using both the wine and champagne pupitre versions.